Pope Gelasius II (ca. 1060/1064 – 29 January 1119), born Giovanni Caetani or Giovanni da Gaeta (also called Coniulo), was Pope from 24 January 1118 to his death in 1119. He was born between 1060 and 1064 at Gaeta into the Pisan branch of the Caetani family. He became a monk of Monte Cassino, was taken to Rome by Pope Urban II, and made papal subdeacon (August 1088) and cardinal deacon of Santa Maria in Cosmedin (probably on 23 September 1088). 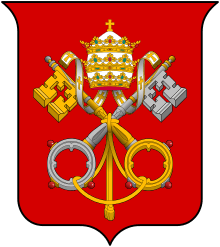 As chancellor of the Holy Roman Church from 1089 to 1118, he drastically reformed the papal administration, establishing a permanent staff of clerks for the papacy, overcoming the previous custom of relying on Roman notaries to write papal documents, and introducing the minuscule curial script. 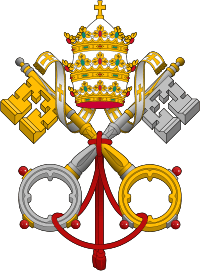 His tenure also established the precedent of the papal chancellor always being a cardinal and holding the office for life or until elected pope. Shortly after his unanimous election to succeed Pope Paschal II in 1118, he was seized by Cencio II Frangipane, a partisan of Holy Roman Emperor Henry V, but was freed by a general uprising of the Romans on his behalf. Henry V sought to enforce the privilege of investiture to the papacy conceded to the emperor by Paschal II, but then revoked. He drove Gelasius II from Rome in March 1118, pronounced his election null and void, and set up Maurice Bourdin, Archbishop of Braga, as antipope under the name of Gregory VIII. Gelasius II fled to Gaeta, where he was ordained a priest on 9 March 1118 and on the following day received episcopal consecration. He at once excommunicated Henry V and the antipope and, under Norman protection, was able to return to Rome in July. But the disturbances of the imperialist party, especially those of the Frangipani, who attacked the Pope while celebrating Mass in the church of St. Prassede, compelled Gelasius II to go once more into exile. He set out for France, consecrating the cathedral of Pisa on the way, and arrived at Marseille in October. He was received with great enthusiasm at Avignon, Montpellier and other cities, held a synod at Vienne in January 1119, and was planning to hold a general council to settle the investiture contest when he died at Cluny. This article incorporates text from a publication now in the public domain: Chisholm, Hugh, ed. (1911). "Gelasius". Encyclopædia Britannica (11th ed.). Cambridge University Press.